For the past 14 years, Doug Flutie‘s name has been synonymous with excellence in both college and professional football. During this time, Doug Flutie has received many honors including: All American at Boston College, 1984 College Football Player of the Year, the 1984 Heisman Trophy Winner, 1991-1994/1996/1997 Grey Cup Most Valuable Player. He played in the Canadian Football League for 8 years, where he was a marquee attraction, being named the league’s Most Outstanding Player an unprecedented six times. Then, in 1998, he signed a four year contract with the National Football League’s Buffalo Bills. During his first year with Buffalo, Doug Flutie earned a Pro Bowl selection and NFL Comeback Player of the Year honors from the Associated Press and Pro Football Weekly after taking over the starting quarterback job five games into the season and leading the Bills to a 7-3 mark in his 10 regular season starts, including 5-1 at home. He also earned the team’s player of the week honors five times that season. In 1999, Doug Flutie set the Bills’ team record for rushing yards by a quarterback and led all NFL quarterbacks with 476 rushing yards. Doug Flutie also passed for career high 3,171 yards (264 of 478) with 19 touchdowns and 16 interceptions. During the 2000 season, Doug Flutie passed for 1,700 yards, with eight touchdowns and three interceptions, completing 132 of 231 pass attempts. He started five games and posted a record of 4-1 as starter. On March 9, 2001, at the age of 38, Doug Flutie signed a six year contract with the San Diego Chargers to become their starting quarterback. Doug Flutie graduated from Boston College with degrees in Communications and Computer Science. He is a member of the Flutie Gang, which recently released its second CD in 2000, entitled Ramblin Scramblin Man. A portion of the proceeds from the sale of this CD go the Doug Flutie, Jr. Foudation, which Doug Flutie started with his wife to honor their autistic son and to help less fortunate families who have children with autism. Doug has also written an autobiography, entitled Flutie, recounting his life both on and off the field. 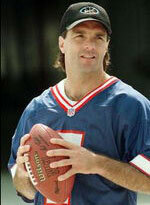 Doug Flutie is married to his high school sweetheart, Laurie Flutie, and is the father of two children. Prejudice against his size has hounded Doug Flutie since his days as a high school quarterback. Here is the inspirational story of how Flutie refuted the doubters and naysayers to become one of the most remarkable figures in recent NFL history. Along the way, Doug Flutie has demonstrated community spirit, charm and a relentless drive that is essential for success as a smaller athlete in a big man's sport. The result is a fascinating and readable account of how one athlete beat the odds to achieve excellence. Awarding-winning quarterback Doug Flutie teaches kids the importance of making tough decisions and the value of remaining open to opportunity.